An interesting article came my way today courtesy of a friend "BC". The article is Deconstructing ShadowStats. Why is it so Loved by its Followers but Scorned by Economists? by Ed Dolan. Mish readers likely know that I believe inflation to be understated, and that I also believe Williams' ShadowStats is wildly on the high side. For example, please consider GDP, Real GDP, and Shadowstats "Theater of the Absurd" GDP. I have also mentioned food inflation on many occasions. While food prices (especially beef) did jump in the last year or so, I recently bought chicken breasts for $.99 a pound and very lean center cut pork chops for $2.49. Sale prices on center cut pork chops have generally ranged from $1.79 to $2.49 for 15 years! Not on sale, I have seen them as high as $5.49. So I buy pork chops on sale, and freeze them. Same with chicken and beef. While non-sale prices have gone up more, ShadowStats calculations seem absurd. Want to combat food inflation? Buy a big freezer, buy food on sale, and freeze it. I never dove in into Williams' numbers to see where he may have gone wrong. Ed Dolan just did that, with convincing tables, graphs, and commentary. A can of tomato sauce that cost $.25 at Piggly Wiggly in 1982 cost $.79 at my local market in early 2015. 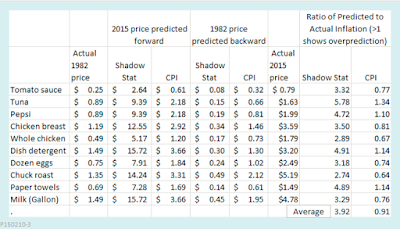 Starting from the 1982 price, the CPI predicts that it should cost $.61 in 2015 while ShadowStats predicts that it should cost $2.64. 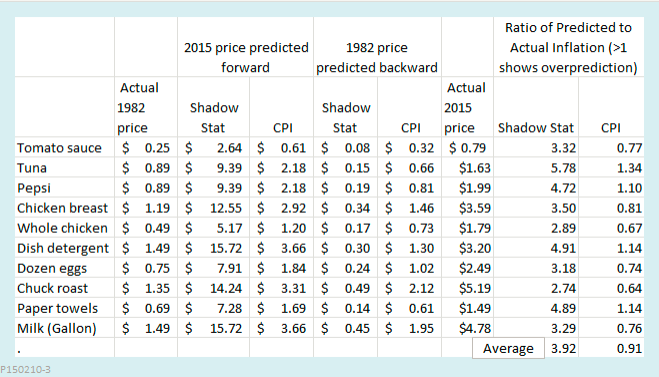 Starting from the 2015 price and working backwards, the CPI predicts that it should have cost $.32 in 1982 while ShadowStats predicts that is should have cost $.08. Based on these calculations, we see that the CPI underestimates inflation, as measured by the Tomato Sauce Index: The ratio of the 2015 predicted price of $.61 to the 2015 actual price, $.79, is .77, an underestimate of 23 percent. The ratio of the ShadowStats prediction to the actual price is 3.32, an overstatement of 223 percent. For tuna, both indexes overestimate inflation, the CPI by 34 percent and ShadowStats by 478 percent, and so on. Has Williams Simply Made a Mistake? The fact that the ShadowStats inflation rate fails every crosscheck makes one wonder whether Williams has simply made some kind of mistake in his calculations. I believe that he has done just that. The mistake, I think, can be found in a table given in a post that represents Williams’ most complete explanation of his methodology. ... Williams’ use of a running total of inflation differentials to compute a “cumulative inflation shortfall” of 5.1 percentage points exaggerates the true impact of the methodological changes made by the BLS. A better way to estimate the cumulative inflation shortfall would be to look at the differences between CPI-U-RS and CPI-U before 1983, the year when the BLS implemented the first of the changes that it incorporates in the CPI-U-RS series. That approach is not quite as precise when we use real-world numbers, as Williams does in his original table. As explained earlier, the actual data include statistical noise caused by changes in weighting and in relative price changes among sectors. However, we can approximate the true inflation shortfall by averaging the numbers for 1981 and 1982 from Williams’ table, giving an estimate of -0.45 percentage points. As mentioned above, Williams’ ShadowStats inflation series incorporates an additional 2.0 percentage point correction to reflect methodological changes that are not captured in the CPI-U-RS series. I would like to examine that number more carefully in a future post, but for the sake of discussion, we can let it stand. If so, it appears to me that, based entirely on Williams’ own data, methods, and assumptions, the adjustment for the ShadowStats inflation series should be about 2.45 percentage points below CPI-U, rather than the 7 percentage points he uses. In my view, Williams alternative measure of inflation would be more convincing if he were to make this correction. It would also be less likely to feed the anti-government paranoia of some of his followers, who allege that the BLS is falsifies source data and manipulates reported indicators in the way that Argentina and some other countries appear to do. If you are a true believer in ShadowStats numbers, I suggest you read Dolan's article in entirety for a convincing rebuttal. By the way, Dolan was quite polite in his rebuttal, concluding with "I would like to thank Williams for taking the time to make detailed comments on an earlier draft of this post. Our private dialog has not yet led to a complete resolution of the issues I have raised here, but I hope that he will address them in future public comments. The search for alternative inflation indicators goes on."